This isn't the kind of blog where I air my dirty laundry, but I will air my clean laundry. Ah, spring, when a young woman's fancy turns to hanging laundry out on the line. Okay, there's also gardening. 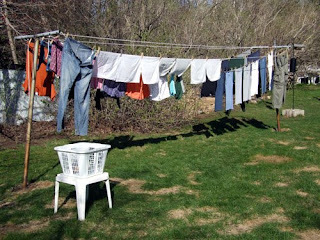 Does it make me weird that all winter I look forward to hanging my laundry outside again in the spring? I don't care. Seriously, this is one of those instances where the green benefits are completely secondary. Yeah, yeah, it uses way less energy and your clothes will last a lot longer, but then best part is... you get to hang your laundry outside! It smells like outside! Putting your laundry out give you a perfectly valid excuse for puttering around the yard in your PJs in the early morning, when the grass is still wet with dew and the birds are singing. Sure, I could just go have my tea out on the back steps, but there is something especially satisfying about enjoying the weather and the outdoors and being productive at the same time. Maybe it is the Midwesterner/Protestant in me: must work, must keep busy. Our laundry line is next to the birdfeeders, and amazingly we haven't had any, erm, "accidents" yet. While I was putting my load of laundry out, a chickadee flew back and forth from the feeder in front of me to the honeysuckle behind me again and again, so close that if I was nimble enough I could have reached out and grabbed it; there were a couple more chickadees in the distance singing spring, fee-bee, fee-bee. A White-throated Sparrow pecked at one of the millet sprays we put out, and a White-crowned Sparrow hopped around the bushes and sang at me. A Downy Woodpecker was not so charitable and stopped by only to scold me before flying off again. A flicker called from the tall maple, a pair of robins flew in and sang for a while, and a junco came over to investigate me. A handful of other brave sparrows kicked around in the leaf litter or visited the birdfeeders. I was outside for maybe a grand total of 20 minutes, and there were other birds singing that I didn't see and can't identify by song.